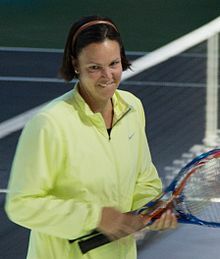 Is iar-imreoir leadóige gairmiúla as na Stáit Aontaithe í Lindsay Ann Davenport Leach. Rugadh í ar an 11 Iúil 1942. Tá 3 craobh Grand Slam buaite aici - 1 Australian Open, 1 Wimbledon agus 1 US Open. Níor bhuaigh sí aon chraobh French Open, ach bhí sí sa leathcheannais uair amháin. Tugadh an leathanach seo cothrom le dáta an 5 Iúil 2018 ag 18:43.